All Windows users want to keep their Windows drivers up-to-date. If you also want to update Windows drivers of your computer then DriveTheLife program is the perfect solution for you. As we all know, updated Windows drivers improve computer hardware performance and provides us fast system access. But the truth is, most of us don’t care about the Windows drivers update or latest Windows driver installations on our Windows PC regularly. If you are using a Windows computer and looking for a free driver update software that can help you in updating Windows drivers very easily then install DriveTheLife software on your PC right now. DriveTheLife is a free program that helps you to download, install, backup, restore, uninstall, and repair all Windows drivers update on Windows PC. The software is fairly compatible with Windows XP, Windows Vista, Windows 8, Windows 8.1, and Windows 7 operating system. The specialty of DriveTheLife program is, you can use it to find and install driver updates according to the compatibility of windows system hardware. It has the ability to detect corrupted, outdated, and missing Windows drivers. 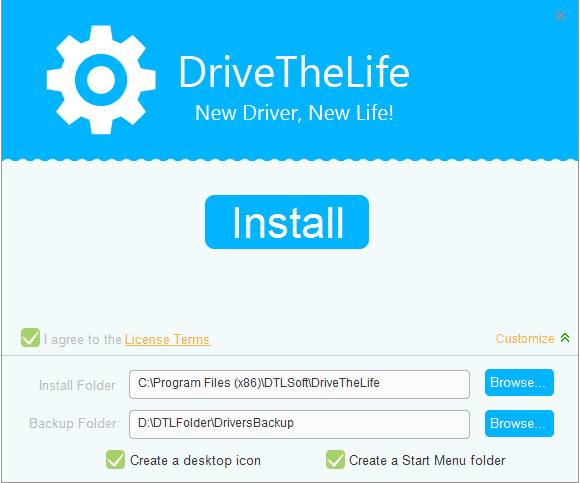 First of all, Download DriveTheLife and install it on your Windows PC. During the installation, you can customize the folder path of “Install Folder” and “Backup Folder” by clicking on Browse button from the install interface. Once the DriveTheLife tool is successfully installed on your Windows computer, launch it to use. Just after the launch, the software will automatically start scanning your computer to find out whether the installed drivers are outdated, missing, corrupted, broken, incorrect or incompatible with the operating system. If it doesn’t start automatically, click on Start button. When scanning process completes, it will display the scanning results with driver’s names and requirements for all Windows drivers. Now, you can take action for the drivers listed in the scan result. If you want to fix the Windows drivers issues (Install, Update, Repair, Reboot, Reinstall, Evaluate) manually then select “Local” option from the left pane of the software window. Now, select the Windows drivers issues (by checking) which you want to fix and then click on Start button. Just after clicking on Start button, the repairing, updating or installing process will begin. Once it completed, you will be able to see the successful message as shown in below screenshot. It may also ask you to Restart your Windows PC to save the changes. So, Restart the PC if asked. That’s it! From the “Manage” option, you can backup, restore and uninstall the PC, drivers. This option is quite helpful for managing PC drivers according to your wish. Select the Windows drivers which you want to backup or restore and then click on Start button. It also offers you the option to customize backup settings. To customize, click on “Backup Settings” option that is located just next to the start button. By clicking on Backup Settings option, you can customize the settings like: System settings, Driver settings, Filter settings, and Proxy settings. Thus you can imagine about the usefulness of DriveTheLife software for updating Windows drivers on Windows operating system. This free program is very small in size and its UI (user interface) is quite impressive. In simple words, it can be said that DriveTheLife helps you to have a well-performing computer without any problems on computer drivers. With the help of this free driver update software, you can easily download, install, update, repair, backup, uninstall and restore Windows drivers for your Windows PC’s wireless network, Bluetooth, media card, Audio card, network card, display card, motherboard, USB WLAN card, and many other drivers too. I would recommend you to try out this amazing free program. If you think DriveTheLife can solve your Windows drivers problem then download DriveTheLife right now on your Windows computer. Feel free to share your valuable comments with us. What do you think about DriveTheLife software? Did you enjoy this Windows guide about updating Windows Drivers using DriveTheLife?